This is a series of film reviews that I am doing as a part of my Pixar marathon. I hope to watch every Pixar movie before the release of their newest production Brave on June 22. I will try to view them without the nostalgia and bias of someone who saw these films throughout my childhood and judge them for what they are and how they’ve aged. Toy Story is the first film that Pixar ever made and has not only become a classic in kid’s movies and animation, but has lead the way for 2 successful and Oscar winning sequels, as well as 9 other fantastic movies. Pixar’s biggest talent (out of many) is the studio’s ability to take us into different worlds; worlds that we’ve always imagined existed but have never been able to express. With their first feature they bring us into the world of toys. A world that nearly all children can imagine in some way, where toys come to life in your absence, running about with their own rules and insecurities. The design and creativity that they have put into Andy’s toys and the society that they have created comes from a place of love. There is so much imagination and creativity and fun flowing throughout the film that you can just picture how much fun they must have in their studio. It isn’t all fun and games however and once you get past the introduction of the toys and all the details that they put into each one, there is true depth to them. Woody is the leader of the bunch, someone who has confidence in his owner, Andy, and tries to reassure the rest of his faithfulness. Rex is a dinosaur, insecure that he will be replaced by a tougher, scarier beast. Hamm is a piggy bank there to provide sarcastic and comic relief at any point. Slinky is a dog shaped slinky who is loyal to Woody like any dog would be. Mr. Potato Head provides a negative, pessimistic voice as is present within any community. They all have unique characteristics that not only fit in with their particular toy, but make them as interesting as any human would be. When Andy gets a new toy (which is a part of an absolutely brilliant sequence in which we get to see what happens in the minds of toys during a kid’s birthday party), one much flashier and exciting than Woody, he begins to question what he believed to be true and is overcome with jealousy. Buzz Lightyear is all the latest amongst children and when Andy gets him, he is overcome with excitement. For Woody, this means that his prized spot on Andy’s bed is taken and he is no longer the hero of Andy’s imagination. Buzz is everything a young boy could want from a toy, he has wings, a laser, and a cool spacesuit. Buzz however, has one slight problem, which again leads to hilarity; he doesn’t know that he’s not actually a space ranger. He fixes his spaceship, tries to communicate with “star command”, and shows off his flying skills. 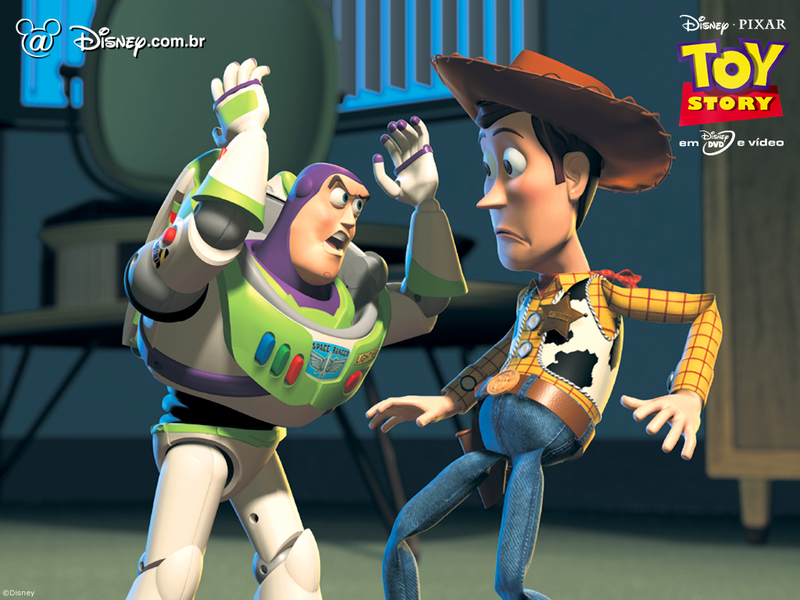 Aside from Woody’s jealousy, Buzz’s innocence absolutely drives him crazy leading him to attempt and get rid of the problem. This leads them on a huge adventure having to defeat their animosity toward one another, escape the toy torturing neighbor kid, and get back home in time to catch the moving truck. Woody’s story arc is relatable not only because he must come to re-imagine his relationship with Andy, but because of his loyalty. Woody has nothing to offer Andy but loyalty. He’s not a cool toy in any sense of the term. He doesn’t bloop and beep like Buzz. He doesn’t provide a specific use like Hamm. He doesn’t have changeable parts like Mr. Potato Head. No, Woody is always there. His draw is in his faithfulness. He will never leave Andy no matter what happens and Andy loves him for that. Yes, Woody is very flawed and acts out in jealousy when he doesn’t get what he wants, but when he works things out he comes to be an even greater leader. It’s hard to be the loyal, steady one, especially when people pass you by for flashier things, but as Woody and Toy Story show us, it’s worth it. Buzz’s story is the opposite of Woody. He is hip and flashy and everyone likes him. He’s the new thing. He is also delusional. He thinks he’s something that he’s really not and when he is confronted with it, his world shatters. He has nothing left to live for and settles for mediocrity. He must find a purpose and identity that remains viable even when he is not the center of attention. He confronts the lie that there is nothing to him besides his gadgets and overcomes his insecurities in order to work together with Woody to get back to Andy and make him happy. Toy Story is a wonderful invitation into the creative minds of Pixar, one that offers wit and depth of the highest kind. It teaches us that when we become jealous with one another and bicker and fight, it causes damage to the others around us. Toy Story is a delight and holds up 17 years after its release. Make you cry moment: When Andy is distraught over not being able to find Woody or Buzz and Bo Peep whispers to herself “Woody, if only you could see how much he misses you”.